Unbelievable Location. Unbeatable Price. Unsurpassed Value. A great location doesn't have to be out of reach. New York's Hotel Pennsylvania is in the heart of Midtown Manhattan, and our surprisingly affordable rates leave more money in your pocket to enjoy the city. 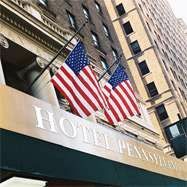 Just steps away from Midtown's most popular attractions, and offering countless easy transportation options, New York's Hotel Pennsylvania puts you in the middle of the action. Each day our guests hit the streets and arrive at fabulous New York City locales within minutes. Marvel at the Empire State Building, savor exciting Times Square and take in a Broadway show or, hop on the subway right by the hotel and head to one of NYC's diverse and exciting neighborhoods. It's all easy. New York's Hotel Pennsylvania: Unbelievable Location. Unbeatable Price. Unsurpassed Value. •One block from Macy's illustrious flagship store—"the largest store in the world"